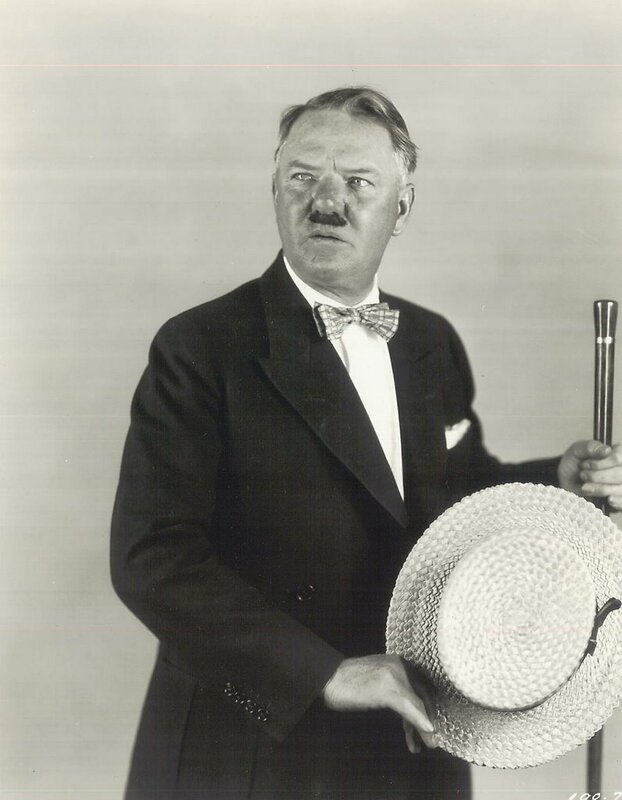 W.C. Fields sporting the 'stache he wore in the 1920s. A silent W.C. Fields? Unimaginable, you say? Well, see for yourself at a screening of 'Running Wild' (1927), one of the comedian's best silent feature films. The screening is tonight (Thursday, June 8) at 7 p.m. at the Leavitt Theatre in downtown Ogunquit, Maine. Tickets are $10 per person; more info is in the press release pasted in below. But what I'd like to emphasize is that yes, W.C. Fields really was very successful in motion pictures, even without his trademark nasal twang. Those who grew up watching the 1930s and 1940s Fields talkies on TV will always think of him first as the older gentleman with the cynical attitude and a fondness for adult beverages. But Fields was in show business long before the movies. As a youth in the early years of the century, his juggling act took him all over the world. The act was silent, to a large extent. So Fields honed his skills in pantomime, which turned out to be perfect training for success in the silent cinema. He was in films as early as 1915, but didn't take the plunge in any serious way until winning a key role in D.W. Griffith's circus melodrama 'Sally of the Sawdust' (1925). 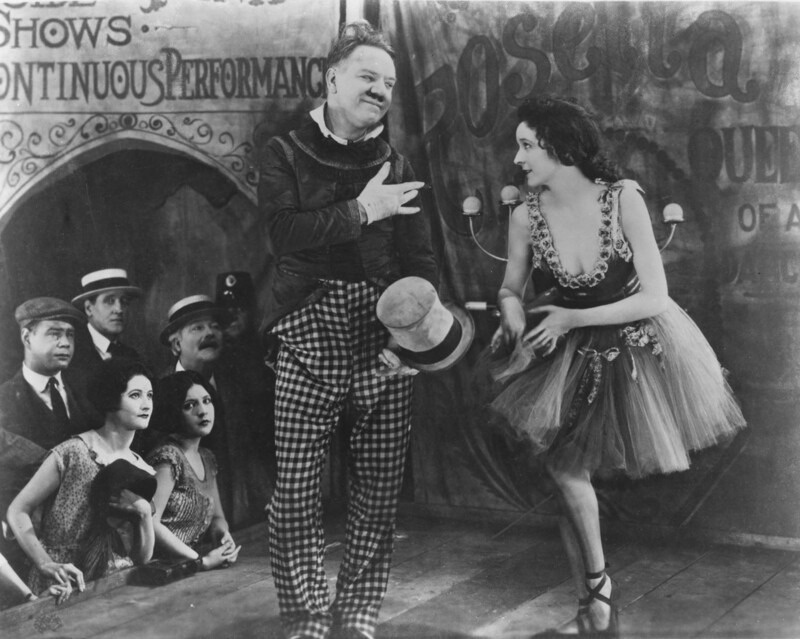 W.C. Fields as a juggler, no less, with Carol Dempster in 'Sally of the Sawdust' (1925). Afterwards, he was signed by Paramount to play lead roles in a series of comedies featuring the then-middle-aged Fields as a kind of frustrated everyman. It was in films such as 'So's Your Old Man' (1926) and 'The Old Army Game' (1926) that Fields ensured such indignities as disrespectful families, howling children, unappreciative bosses, clueless customers, and just plain hard luck. To me, it's like his silent-era adventures directly led to the more cynical outlook in his talking pictures later on. In any case, 'Running Wild' is a flick worth catching. It contains great comedy, plus it's also a window into attitudes about child-rearing and discipline that today would probably get a parent arrested. The poster for this season's silent film program at the Leavitt Theatre in Ogunquit, Maine. 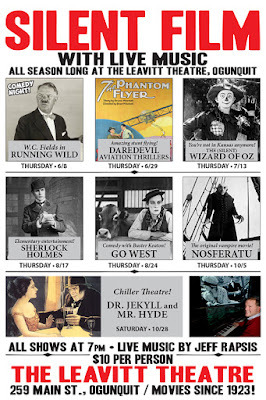 OGUNQUIT, Maine—Classics of the silent film era will return to the big screen at Ogunquit's Leavitt Theatre, which is hosting a season of vintage cinema with live music in the historic facility. The series gives area film fans a chance to see great movies from the pioneering days of cinema as they were intended to be shown—on the big screen, with an audience, and accompanied by live music. Most screenings are on Thursday evenings. Next up is a 'Running Wild' (1927), a rare silent comedy starring W.C. Fields. Showtime is Thursday, June 8 at 7 p.m. In 'Running Wild,' Fields plays a hen-pecked husband saddled with a disrespectful family and stuck in a dead-end job. Things change suddenly when Fields inadvertently comes under the spell of a vaudeville hypnotist, who transforms him into a hard-charging aggressive alpha-male, with unexpected consequences. 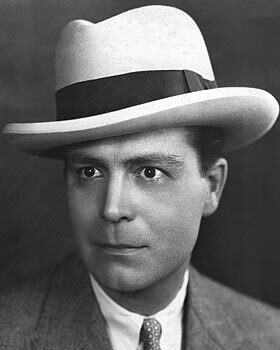 Although he later achieved lasting fame in talking pictures, Fields was a major performer during the silent film era, starring in a series of popular features for Paramount Pictures. 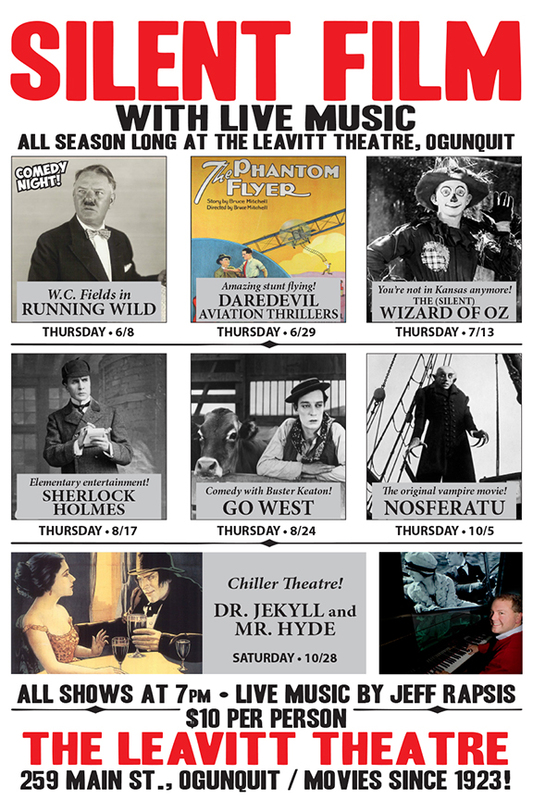 The Leavitt's silent film series runs through October, concluding with a Halloween screening of the early horror classic 'Dr. Jekyll and Mr. Hyde' (1920), to be shown on Saturday, Oct. 28. Admission for each screening is $10 per person. The series includes comedies, adventure films, a silent film version of 'The Wizard of Oz' (1925), the recently rediscovered original big-screen adaptation of 'Sherlock Holmes' (1916), and the first-ever vampire movie, 'Nosferatu' (1922). "These are the films that first made people fall in love with the movies, and we're thrilled to present them again on the big screen," said Peter Clayton, the Leavitt's long-time owner. The Leavitt, a summer-only moviehouse, opened in 1923 at the height of the silent film era, and has been showing movies to summertime visitors for nine decades. The silent film series honors the theater's long service as a moviehouse that has entertained generations of Seacoast residents and visitors, in good times and in bad. "These movies were intended to be shown in this kind of environment, and with live music and with an audience," Clayton said. "Put it all together, and you've got great entertainment that still has a lot of power to move people." Live music for each program will be provided by Jeff Rapsis, a New Hampshire-based performer and composer who specializes in scoring silent films. In accompanying silent films live, Rapsis uses a digital synthesizer to recreate the texture of the full orchestra. He improvises the music in real time, as the movie is shown. In scoring a movie, Rapsis creates music to help modern movie-goers accept silent film as a vital art form rather than something antiquated or obsolete. "Silent film is a timeless art form that still has a unique emotional power, as the recent success of 'The Artist' has shown," Rapsis said. • Thursday, June 29 at 7 p.m.: 'Daredevil Aviation Double Feature.' Join fellow flyboys and flygals for a double feature of vintage silent film featuring 1920s biplane action. • Thursday, July 13 at 7 p.m.: 'The Wizard of Oz' (1925) starring Larry Semon. 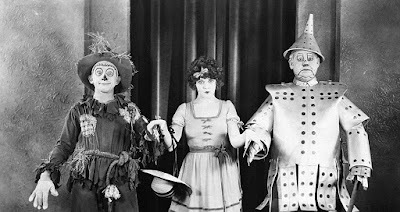 Early silent film version of Frank L. Baum's immortal tales features silent comedian Larry Semon in a slapstick romp that also casts Oliver Hardy as the Tin Man. Oz as you've never seen it before! • Thursday, Aug. 17 at 7 p.m.: 'Sherlock Holmes' (1916) starring William Gillette. Recently discovered in France after being lost for nearly a century, see this original 1916 adaptation of Sherlock Holmes stories as performed by William Gillette, the actor who created the role on stage. • Thursday, Aug. 24 at 7 p.m.: 'Go West' (1925) starring Buster Keaton. Buster's ranch comedy about the stone-faced comedian and his enduring romance with—a cow! Rustle up some belly laughs as Buster must prove himself worthy once again. • Thursday, Oct. 5 at 7 p.m.: 'Nosferatu' (1922). Experience the original silent film adaptation of Bram Stoker's famous 'Dracula' story. Still scary after all these years—and some critics believe this version is not only the best ever done, but has actually become creepier with the passage of time. • Saturday, Oct. 28 at 7 p.m.: 'Dr. Jekyll and Mr. Hyde' (1920) starring John Barrymore; Just in time for Halloween! John Barrymore plays both title roles in the original silent film adaptation of the classic novella by Robert Louis Stevenson. A performance that helped establish Barrymore as one of the silent era's top stars. All programs are at 7 p.m. and admission is $10 per person. 'Running Wild' (1927), a comedy starring W.C. Fields, will be shown on Thursday, June 8 at 7 p.m. at the Leavitt Fine Arts Theatre, 259 Main St. Route 1, Ogunquit, Maine; (207) 646-3123; admission is $10 per person, general seating. For more information, visit www.leavittheatre.com. For more info on the music, visit www.jeffrapsis.com. I can't say how delighted I was to find this poster at last night's 'Wizard of Oz' screening at the Aeronaut Brewing Co. in Somerville, Mass. Thanks so much to whoever did this! In other good news, last night I was reunited with my bell! Not just any bell, but a brass school bell that once belonged to my grandmother. For a few years now, I've brought it along with me for use in silent film accompaniment at appropriate times. A few months ago, however, I noticed it was not in my crate of traveling gear—and, actually, was nowhere to be found! I had just returned from a road-trip to gigs in Ohio, so I called around, thinking I'd somehow left it behind. No dice. This was a real loss because not only was it a family heirloom, it was a darned good piece of accompaniment hardware. Not all bells are created equal, and this one had a particularly brassy, clangy sound that I came to regard as indispensable for certain moments. Example: the flashback near the beginning of Fritz Lang's space opera 'Woman in the Moon' (1929), when a professor frantically rings a bell to quiet a rowdy debate that's spiralling out of control. The bell (and the whistle that's also blown) really get the score off to a rousing start. Another example: a key moment in the climax of Josef von Sternberg's 'The Last Command' (1928) when a handbell is rung as a signal during a battle. It occurs at just the right time when we need a break from big revolutionary war battle music. After giving it up for lost, I trolled eBay for a replacement bell, finding one pretty easily. It arrived shortly after, but I couldn't bring myself to open the package. It sat in our dining room for weeks, as I was still mourning the loss of my grandmother's bell. Weird how I finally opened it this weekend in advance of the Aeronaut show, as we often use a bell to quell the noisy crowd when starting a silent film show. I tried it. Clang! Nice, but lighter and more polite—nothing like my grandmother's old bell. And then, just before last night's show, the Aeronaut staffer went to get their own bell, and found two of them—one being the bell I'd mislaid month ago, apparently right there! Now, if we could only find a cure for cancer, solve climate change, and find world peace. Some say it's enough to drive one to drink. So I'm glad we're showing it in a brewery. It's the silent version of 'The Wizard of Oz' (1925), which I'm accompanying tonight (Sunday, June 4) at the Aeronaut Brewery, 14 Tyler St., Somerville, Mass. Showtime is 7:30 p.m. Admission is $10 per person. There's a press release below with more info on the film, which is nothing like the familiar 1939 MGM musical version starring Judy Garland. 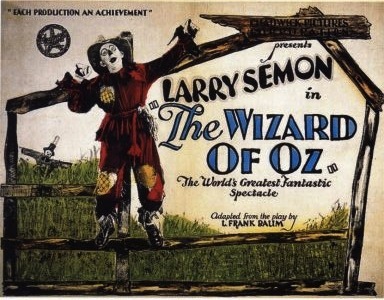 Instead, the silent 'Wizard' was produced as a vehicle for comedian Larry Semon, who used the Oz characters to create a smorgasbord of slapstick. The result was a picture that for years has been known as one of the silent era's great misfires. Its studio, Chadwick Pictures, ran into financial troubles the year it was released, and was unable to distribute prints to many locations. It fared poorly at the box office, and among the few who attended, it disappointed Oz fans due to scant resemblance to the stories by author L. Frank Baum. It's that same look of baffled puzzlement you get when you mention the silent films of W.C. Fields: How is that even possible? But then you have to remember that so many stories got their first big-screen treatment during the silent era. Among the more well known: 'Ben Hur' (1925) and 'Phantom of the Opera' (1925), both remade several times since. Other examples abound. A lesser known one is the silent 'Peter Pan' (1924), created with input from author J.M. Barrie himself, and which still holds up well. Heck, there were even performers in the silent era with the same names of later stars. How about the silent Harrison Ford? (That's him on the right.) Or the silent James Mason, anyone? But as so often happens, not every original screen adaptation hit the mark. In the case of Semon's 'Wizard of Oz,' the film has come down to us with a reputation as a disappointment. And how could anything really compare to the magical musical version that Hollywood produced not much later? But I included the silent 'Oz' in a recent program in Wilton, N.H., and was surprised to find it greeted by continuous hearty laughter and even applause. People really enjoyed it! Maybe it's taken nine decades for the silent 'Oz' to find an audience. I don't know. But I've decided to start trying it out in other venues, including the Aeronaut this evening. We'll see if it provokes anything like the same reaction. And if it doesn't, there's always beer. 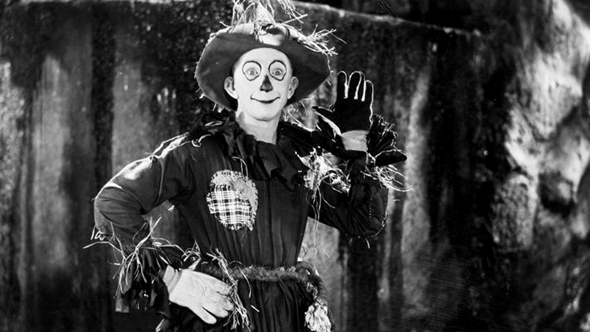 Larry Semon directed, and plays the Scarecrow, in 'The Wizard of Oz' (1925). SOMERVILLE, Mass. — You won't find Judy Garland in this version of Oz, or much of anything else that's familiar. That's because it's the forgotten 1925 silent film version of the famous tale. Long overshadowed by the immensely popular 1939 remake, the rarely seen silent version of 'The Wizard of Oz' (1925) will be screened one time only on Sunday, June 4 at 7:30 p.m. at the Aeronaut Brewing Co., 14 Tyler St., Somerville, Mass. The program, which will include an earlier short Oz film also based on stories and characters of author L. Frank Baum, will be accompanied by Jeff Rapsis, a New Hampshire-based silent film musician. Admission is $10 per person. Tickets are available online at www.eventbrite.com; search on "Aeronaut Brewery." 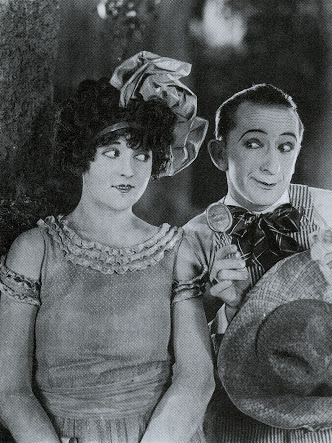 The silent version, released by long-forgotten Chadwick Pictures, was intended as a vehicle for slapstick comedian Larry Semon, who directed the picture and played the role of the scarecrow. Dorothy is played by Dorothy Dwan, Semon's wife. Also in the cast is Oliver Hardy as the Tin Man. Prior to his teaming with comedian Stan Laurel later in the 1920s, Hardy often played Semon's comic foil. 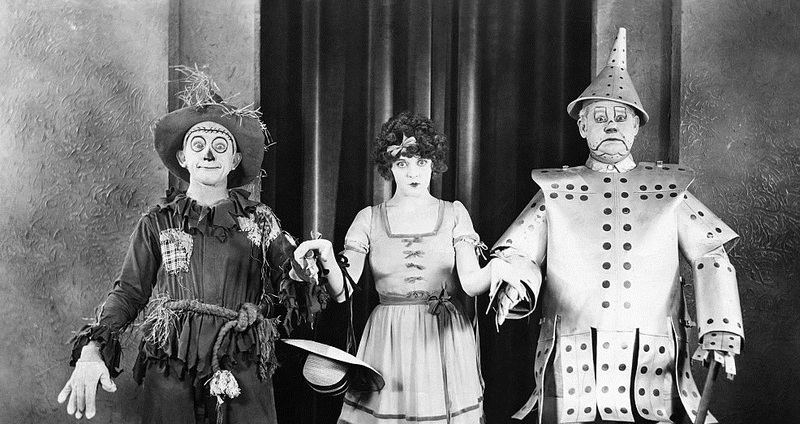 Larry Semon, Dorothy Dwan, and Oliver Hardy in 'The Wizard of Oz' (1925). The silent 'Wizard of Oz' bears little resemblance to the highly polished MGM musical released just 14 years later. However, due to the enduring worldwide popularity of Baum's 'Oz' characters and stories, the silent 'Wizard of Oz' remains an object of great curiosity among fans. The film departs radically from the novel upon which it is based, introducing new characters and exploits. Along with a completely different plot, the film is all set in a world that is only barely recognizable as the Land of Oz from the books. The film focuses mainly upon Semon's character, who is analogous to Ray Bolger's Scarecrow character in the 1939 version. The major departure from the book and film is that the Scarecrow, the Tin Man, and the Cowardly Lion are not actually characters, but are in fact disguises donned by three farm hands who find themselves swept into Oz by a tornado. Dorothy is here played by Dorothy Dwan — Semon's wife — as a young woman. In a drastic departure from the original book, the Tin Man (played by Oliver Hardy) is Semon's rival for Dorothy's affections. Legend has it that Semon's version of 'Wizard' was so poorly received, Chadwick Studios was forced to file for bankruptcy while the picture was in theaters. In truth, the picture was a modest success, and Chadwick continued to release films through 1928, when the studio shut down prior to the industry's switch to synchronized sound. Accompanist Jeff Rapsis specializes in creating music that bridges the gap between an older film and the expectations of today's audiences. Using a digital synthesizer that recreates the texture of a full orchestra, he improvises scores in real time as a movie unfolds, so that the music for no two screenings is the same. "It's kind of a high wire act, but it helps create an emotional energy that's part of the silent film experience," Rapsis said. "It's easier to be in tune with the emotional line of the movie and the audience's reaction when I'm able to follow what's on screen, rather than be buried in sheet music," he said. Because silent films were designed to be shown to large audiences in theaters with live music, the best way to experience them is to recreate the conditions in which they were first shown, Rapsis said. "Films such as 'The Wizard of Oz' were created to be shown on the big screen to large audiences as a communal experience," Rapsis said. "With an audience and live music, silent films come to life in the way their makers intended. Not only are they entertaining, but they give today's audiences a chance to understand what caused people to first fall in love with the movies." Dorothy Dwan and Larry Semon, real-life husband and wife, in 'The Wizard of Oz' (1925). The silent version of 'The Wizard of Oz' (1925) and other Oz-related silent films will be shown on Sunday, June 4 at 7:30 p.m. at the Aeronaut Brewing Co., 14 Tyler St., Somerville, Mass. Admission is $10 per person. Tickets are available online at www.eventbrite.com; search on "Aeronaut Brewery." For more info about Aeronaut Brewing, visit www.aeronautbrewing.com. For more information about the music, visit www.jeffrapsis.com.